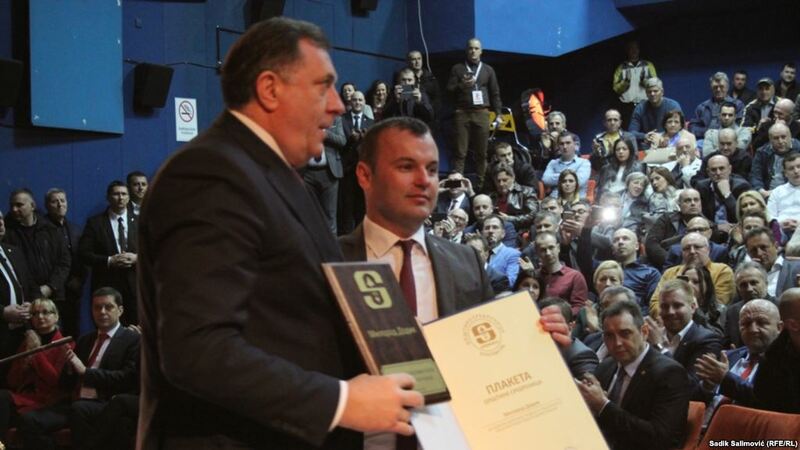 In BiH, a country full of controversies, it is not unusual that Milorad Dodik, who denies the genocide in Srebrenica, receives the highest award of this particular municipality. It is reminded that the genocide in and around Srebrenica in July 1995 has been confirmed by several international courts, including the International Court of Justice in the verdict of the case “Bosnia and Herzegovina vs Serbia”, eleven years ago. In his statements early after the war, Dodik said several times that the “genocide has taken place in Srebrenica” so, “Radovan Karadžić and Ratko Mladić must be sentenced” in this regard. Less than a decade after that, Dodik became a man who repeates that there was no genocide in Srebrenica and that Karadžić and Mladić are heroes, not war criminals. His negation of the events was so irritating for the international community’s representatives that they, from various posts, sent sharp warnings that, that genocide is a fact. Among other reasons, the genocide denial was one of the reasons that the U.S. administration has put him under sanctions, which are still in power. But, the fact that Republika Srpska’s government invested a huge amount of money in the development of the Srebrenica Municipality, is also true. On top of that, only in the past year, the Serbian Government has donated more than five million euros for the “sustainable return” of refugees from Srebrenica. After two decades of Bosniak governing at the Srebrenica Municipality, at the 2016 Local Elections, the Alliance of Independent Social Democrats candidate, Mladen Grujičić, became the city’s mayor. Grujičić then nominated his party leader, Dodik, for the highest award of Municipality and his nomination was accepted by the local Assembly, but without the approving votes of Bosniaks. Outraged by such a procedure, the Bosniak MPs in the Assembly refused to participate in the ceremony, which took the place on Sunday, on the Srebrenica Municipality Day. Dodik said that he considers this award of the Municipality of Srebrenica (the greatest) – the plaque with the golden coat of arms- not as a victory over someone, but as a recognition of the development of this local community. “For me, this is a recognition, not only of my work, but also of the relation of the Republika Srpska and this municipality over the years; in difficult conditions and in the post-war reconstruction of Srebrenica. This is a specific place, because of the tragedy that has occurred here; however, it is also the place that gives us a chance for reconciliation. All of those who committed a kind of crime must be sentenced, and pain of those who survived must be respected,” Dodik told reporters after the ceremonial session at the Municipal Assembly’s building. This statement is in controversy with his earlier statements about Karadžić and Mladić, but knowing that Dodik will be the candidate for the Serb member of the BiH Presidency in the General Elections in October, his stance is perceived as part of his campaign and an attempt to get the support of Bosniak voters, something that he will desperately need.